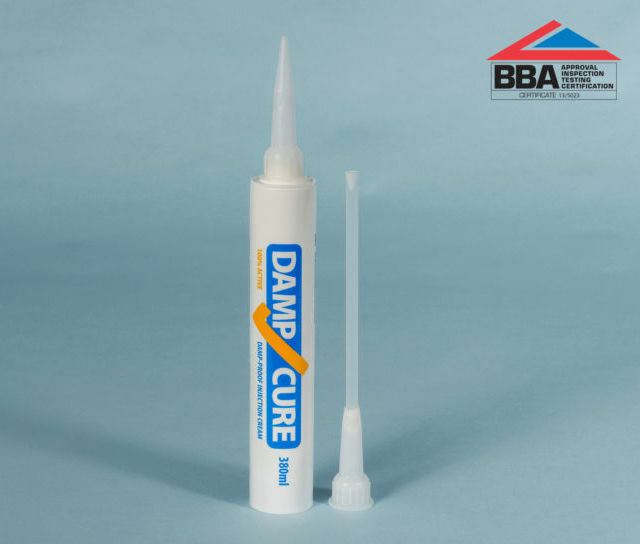 Damp-Cure rising damp cream is supplied in a low-cost 380ml tube. Inject a new chemical damp proof course along the base of the wall to stop rising damp. 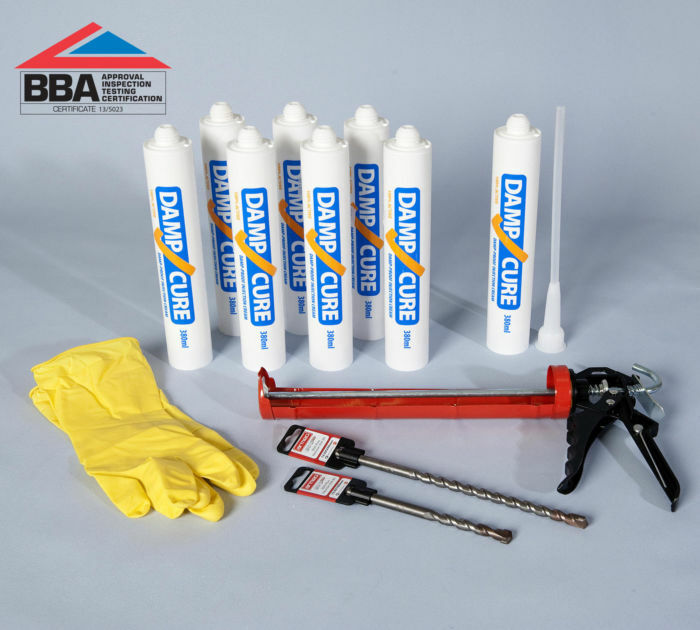 The cream is injected directly into 12mm holes drilled in a mortar bed at regular intervals, preferably at perp-end joints, for an effective damp course treatment. 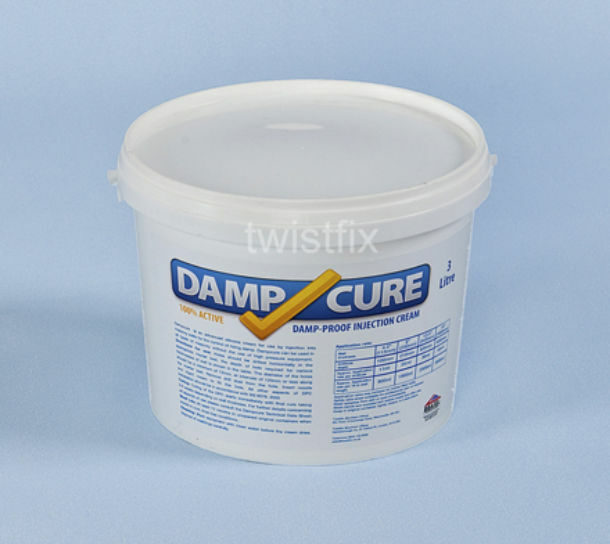 Damp-Cure cream is formulated without thickening agents, using an emulsi­fica­tion process to deliver a 100% active damp proof cream at trade prices. Solid walls can be drilled and injected from the most convenient side. The inner and outer skins of a cavity wall should be treated independently of each other, drilling and injecting the both sides of the wall to form a chemical DPC in each. Renew damp plaster to complete the damp proofing treatment. Damp core was of a liquid rather than a thick consistency as I expected. Is that correct. Doesn't really matter fitted it over the weekend and a kitchen is being fitted Tuesday. Hope it cures the problem. Very fast delivery and a very good product and very simple instructions and very easy to use will use again and recommend. Have used this product before pity they still supply the same size/brand of silicone gun as there cartridges dont fit. 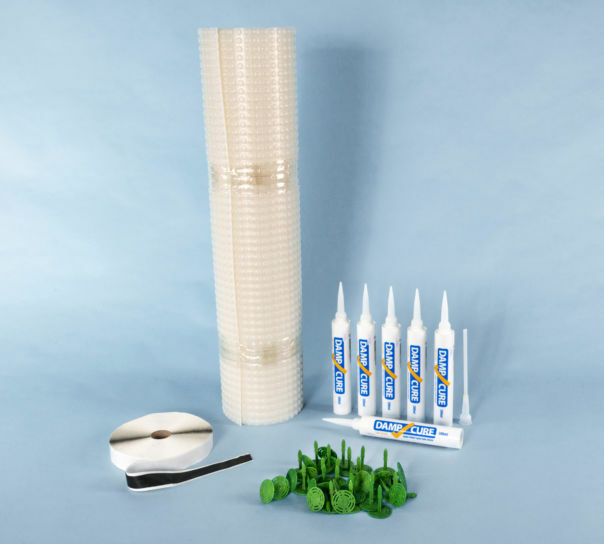 Pity they dont sell a package of cartridges without the silicone gun and drill bits as it was cheaper to buy the kit rather than purchase eight separate cartridges. The service and product were good however the payment part of the website does not work well - I was left not knowing if I had paid or not - should I do it again and end up paying twice? The service was good because as no payment was made but the order placed Twistfix rang me to obtain payment and sort out delivery. We decorated and fitted copings to a 40m+ external wall last year, only to find that with the torrential rain that it has no damp course. The wall was subsequently soaking up from the ground and the expensive paint starting to yellow and flake. Purchased the damp cure kit. This arrived swiftly and contained all the necessaries to complete the job. I had to drill some 270 holes which was no fun. The drills supplied were ok but the shorter one did blunt off 2/3 of the way through. Kind of expected. The cream was then injected via the supplied gun and it is currently sat there soaking along the mortar bed. It is too early to review the performance as the wall is too wet but hoping it will do the trick. There were x2 tubes left over so before plugging the holes, will re-fill again. For the job all you need is an SDS drill (easily/­cheaply hired). Not a glamorous job but will pay dividends for sure over the years. Ordered some damp proofing cream after going through your very detailed and helpful PDF's. Quick delivery, no fuss and did exactly what it said it would in an 18thC property. Great superfast delivery... Perfect. My builder recommended this product as he said its great and most competent DIYers can do it themselves and hence save money! Nice. 2 minutes on the phone to order and delivery the following day, even though it was a very small order. What point in saying more? really good stuff, dose what it says it does,,,, and its easy to use......!